When the fat days come, all the people gonna dance and sing. My life intersected with Kevin Hogan’s in July of 2007 when he enrolled in North St. YouthBuild, a GED and construction training program where I was the director. Kevin (and 377 other students) dropped out of Beaumont High School the year before, contributing to the school’s abysmal 37.8% graduation rate. He came into YouthBuild with a 6th grade reading level and was the class clown, constantly getting in trouble for slacking off and distracting others with his antics. He was also a pretty amazing athlete. Being the program director at YouthBuild is the hardest thing I’ve ever done. It definitely left a mark on me — I don’t know if it’s a scar or a beauty mark. I’m used to achieving success proportional to my effort. YouthBuild continues to haunt me because I poured everything I had into it, and I’m not sure if it made a difference. Was it worth it? I don’t know. Of the 47 students accepted into the program, the only one who was there on very the first day and the very last day was Kevin Hogan. I still find that amazing. He got kicked out of YouthBuild at the end of November after being sent home six times for being disruptive or not participating, but we later let him back in until the program concluded in June. The incident that paralyzed Kevin from the waist down wasn’t the first time he’d been shot. A week after he returned to YouthBuild in March of 2008, he was accidentally shot in the back by a ricocheting sawed-off shotgun blast in the basement of his stepbrother’s apartment. He came to class the next day as though nothing happened and showed me the shrapnel embedded in his back. The last time I saw Kevin before he wound up in a wheelchair was at a YouthBuild reunion on September 18, 2010. By that time, he had an 11-week-old baby boy. He was one of the few students who showed up to the reunion and was the most excited about it. Afterwards, I gave him a ride home to his house on Natural Bridge. A month later, he was shot in the back on the front steps of that same house. There were five murders and 30 armed robberies in The Greater Ville in 2010. It was tied that year with the adjacent JeffVanderLou neighborhood for the most aggravated assaults with guns: 114. The title comes from Kevin’s comment about his friend Slim who survived being shot 13 times. He echoes that sentiment at the end of the video while talking about fatherhood: “I’m gonna be there for mine… just gotta stay there.” To me, it underscores the importance of sticking around in an environment where people are prone to walking out or dying unexpectedly. Kevin could have been killed, but he wasn’t. He’s still here. And I’m still here, too. To the extent that my time at YouthBuild adds up to anything, it’s going to be the result of continuing to be involved in some students’ lives on at least some level over the long haul. Pervasive violence has lost its shock value for Kevin. He casually lists his relatives and friends who have been shot as though his experience is nothing out of the ordinary. It’s amazing what people can get used to as being normal. Kevin seems to inhabit another world, and yet I don’t know how you can live in the city of St. Louis and not feel connected to it in some way. And if you feel connected to it, you’re obligated to do something about it. Besides physical proximity, there are other connections between Kevin’s world and mine. We both have sons. Listening to Kevin talk about Kevion, I’m struck by the nearly universal (if sometime unfounded) hope that somehow things will be better for the next generation, balanced with a dad’s fear that he can’t keep the bad things away. Kevin’s story brings together a lot of big issues, including violence, education, race, poverty and fatherhood. Hopefully, it will spark some constructive conversations. Where is the line between personal responsibility and the institutional realities someone is born into? How much of a person’s life is in his control? What are the limits of free will? What would I do in Kevin’s situation? I don’t know. There’s a tired old debate in which both sides are a little bit right and both sides are wrong. On the one hand, conservatives say that people should pull themselves up by their own bootstraps, and if they fail to do that, they get what they deserve because their lot in life is all up to them. Dr. King’s response still stands: “It’s all right to tell a man to lift himself by his own bootstraps, but it is cruel jest to say to a bootless man that he ought to lift himself by his own bootstraps.” On the other hand, liberals claim that if the disadvantaged just had access to the right social programs, they’d jump at the opportunity to improve their lives. Sometimes, this comes with an undertone of rescuing the noble savages because they’re powerless to help themselves. From what I saw at YouthBuild, many people have an almost unlimited capacity to work against their own best interests and keep hurting themselves again and again even when they’re surrounded with wraparound services. My take is that we need to have programs like YouthBuild available so that when people decide to change, they’re there to help. Frustratingly, you can’t change people who don’t want to change, though. It’s not often that you get to hear from people like Kevin Hogan in their own words in the media or even on YouTube. My goal with this little video is to interest someone with better videography skills to do a longer treatment to tell Kevin’s story and the stories of other YouthBuild students and people involved with similar programs in St. Louis. I can help arrange interviews. Contact me at webguy@fatdays.com if you want to put a face on the news reports. At work, I was recently tasked with choosing a PHP framework to use for the next version of our main site. It was a bit daunting because there are so many different ones. If you’re using Ruby for web development, you’re probably using Rails, but if you’re using PHP, there’s a good chance you made up your own homegrown framework. That’s what Rasmus Lerdorf, the creator of PHP, encourages developers to do. For better and worse, it’s part of the culture of PHP, so there is no standard framework. I looked at Yii, Symfony, CodeIgniter, Laravel, SilverStripe, CakePHP, Zend, and Kohana. Almost any of them probably would have been fine. I decided to go with Yii based on the features below. You can compare Yii to other frameworks at vsChart.com. If you’re like a lot of people, you made a New Year’s resolution related to exercise. And, if you’re like a lot of people, that resolution is starting to unravel right about now, a few weeks into the new year. To help keep you on track, I’d like to offer up some basic advice based on what’s worked for me. There aren’t any secrets or shortcuts here. Like anything, if you want to get to it, you’ve got to go through it. Set a goal and put some numbers on it. Then keep track of your workouts so you can measure your progress. Saying you want to be healthy or get in shape is so vague as to be meaningless. Define your goal in terms of something measurable like the number of pounds you want to lose, the weight you want to be able to deadlift, the number of inches you want to add to your chest, or the time you want for a 5K. If all of your workouts consist of going through the motions to jog at the same moderate pace for the same duration, you’re wasting your time. The point of practicing anything is to get better, not to just keep doing the same thing. Think of yourself as an athlete. Set a goal for every workout. You’re not doing it just to do it; you’re doing it to get better. You should have a plan of attack before you get to the gym. Know what you’re going to do before you get there, and try to bump up your performance a little each time. It’s amazing how far you can get in a year. If you’re lifting weights, every set is a chance to improve by manipulating the weight, reps, bar speed, or rest. No matter where you’re starting, there’s a weight that’s appropriately challenging for you. When you’re always striving to get to the next level, it keeps things from getting boring. Last Friday, I did a set of five squats with 332 pounds — a new personal record. For me, that sense of achievement is what makes it fun and keeps me hooked. To record your workout activities, I recommend Fitocracy. It adds community and gamification to the mix to help you reach your goals. For keeping track of what you eat (something I don’t do), my friend Jason swears by Lose It!. It’s all you. And it’s going to be hard. A resolution isn’t going to work unless it’s something you want to do. Whether you’re healthy now or not, if you want to be, it’s something you have to work at for the rest of your life. Being in shape is not a 12-week program where you reach your destination and quit or coast; it’s an ongoing process that’s never done. The commitment and motivation have to come from you — not your trainer, spouse, or anyone else. You have to want it enough to overcome the obstacles you’ll inevitably encounter. One of the great things about pushing yourself on a regular basis in the gym is that it strengthens your resolve in other areas of life, too. When you do something hard everyday, it makes it easier to do other things that are hard. I’m not a morning person, but I set the alarm for 5:45 every morning and head to the basement to lift. The only person who cares whether I do it or not is me. I’m only accountable to myself. There are days when the alarm goes off and I’m scared to get out of bed because I know how hard the workout that awaits me is going to be, but I do it anyway. It hurts, but it hurts worse to let yourself down. The more workouts you miss, the easier it is to keep missing them, and the harder it is to get back into it. Do everything you can to take away excuses for not working out. Try to exercise at the same time everyday. Make it a priority. If you can, workout first thing in the morning, before anything happens to throw you off your schedule. Anytime you change your daily routine, it’s hard for the first few weeks, but eventually you’ll get to a point where you have to workout to feel like yourself. There is never an absolute answer to everything, except of course that you have to do your squats. If you’re going to exercise, you should lift weights. And if you lift weights, squats are the one exercise you should definitely do. They strengthen almost your entire body using a functional movement that has crossover benefits for daily activities like getting out of a chair and picking things up. 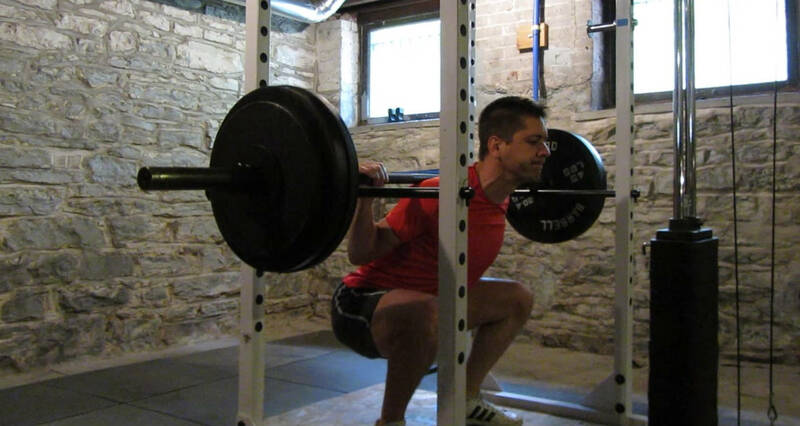 Whether you want to lose weight or build muscle, and whether you’re male or female, squats will do the right thing. Make sure when you do them that you come down low enough so that the tops of your thighs are parallel to the floor. Unless you’re a genetic freak, eating like Michael Phelps, or using steroids, squats won’t make you bulky. I’ve lifted weights off and on since college. For about the last four and a half years, I haven’t taken any extended breaks. I’ve tried lots of different routines, but I’ve made the most progress since switching to a powerlifting style with low reps and high weight for the last two years. An article in Men’s Journal moved me in that direction. The parts of your body are made to work together. To get stronger, you should focus on compound, multi-joint exercises like squats, deadlifts, bench presses, overhead presses, and power cleans instead of isolation movements like biceps curls. Mark Rippetoe’s Starting Strength program is a simple (in terms of complexity, not effort), effective approach to getting the most out of your time in the gym. What is wrong with pants in America today? It used to be easy. When I needed a new pair of jeans, I just walked into a store and bought Levi’s 569s. They were the only jeans I’d found that fit off the rack. Back in March, I went to Macy’s to buy a pair to replace the threadbare ones in my closet. They didn’t have my size (29 x 32) in stock. The salesclerk checked the computer and reported that no Macy’s stores in Missouri or Illinois had that size in stock, but he’d located a pair in New Jersey. New Jersey! I am in decent shape. Apparently, that makes me a hard-to-fit rarity. If I were looking for jeans with a 40″ waist, they had plenty of those in the store. I’ll note that there’s a lot of obvious psychological manipulation in the way jeans are sized. In the world of Levi’s, I have a 29″ waist, but in reality, I have a 32″ waist. I suppose that’s meant to appeal to people who think “I like these jeans because they tell me I’m skinnier than I really am.” I wonder how big those jeans with the 40″ waist size really are. The whole point of buying mass-produced jeans with a specific style number from the same manufacturer was to make that decision once and then never have to think about it again. Levi’s touts the 569s as “our loosest wide leg jean.” If those are loose, I can’t imagine what their 510 Super Skinny jeans are like. I probably couldn’t even get them over my calves. Of the 16 different styles listed on Levi’s website, can’t at least one of them actually be loose? This issue is not unique to Levi’s. I had the same problem trying to replace an old pair of relaxed-fit “classic” khakis from the Gap. They didn’t have 29x32s in the store, so I ordered them online. The rise was ridiculously low, the upper thighs were tight, and the waist was loose and gappy — just like the Levi’s. You can’t call a style “classic” if you keep changing the cut to appeal to hipsters. Are you happy now, hipsters? Your insidious plot to make skinny jeans ubiquitous has come to fruition. Feeling somewhat panicky about finding a pair of jeans that fit before my old ones completely disintegrated, I turned to Google and found MakeYourOwnJeans.com. As their domain name suggests, you send them your measurements, and they send you a pair of custom-made jeans. MakeYourOwnJeans.com is based in India. (My three pairs of “American” Levi’s 569s were made in China, Egypt and Cambodia.) They offer jeans in a dizzying array of colors, washes and weights. They also make custom shirts, suits, chinos and other items, including, intriguingly, ’68 comeback Elvis leather suits. I ordered a pair of Dark Blue 14.5oz Heavy Denim Jeans on November 23. They were surprisingly affordable: $51 + $2 for antique copper star rivets + $2 for an iPhone coin pocket + $16 for shipping = $71 total. We are sure for many of you this must be the first time you will be wearing a jeans specially made and enzyme washed for you, else the standard jeans you buy from any store are bulk made in thousands of quantity together using one measurement system. Making your own Jeans and other clothing is an unique and incomparable experience which you should be proud of, the very existence of this garment is due to your inputs, you are a very integral part of this garment without whom this would not have been possible. MakeYourOwnJeans.com, a Harryfashion Company, is very committed to the Harry character. He also sent the order update email message and signed the “checking report.” Harry has a new, loyal customer. — Son Volt. "Route". Trace. 1995. Proudly powered by WordPress Theme: Fat Days.